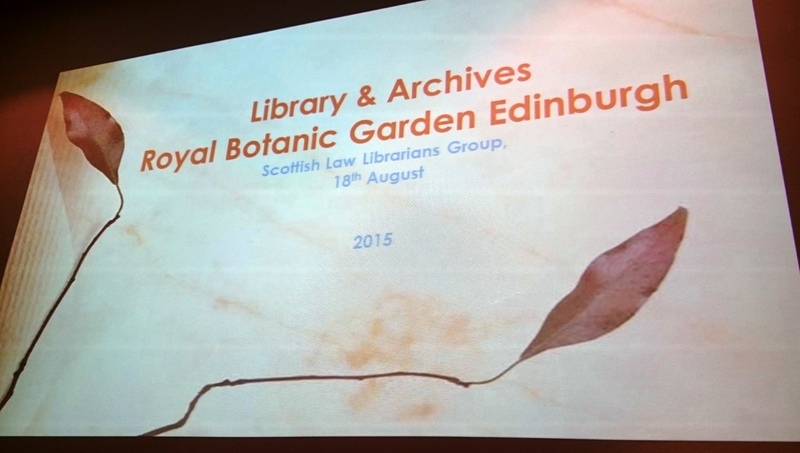 In August, SLLG members were treated to an informative evening about the history and work of the Botanic Garden in Edinburgh, hosted by the Botanic Garden’s enthusiastic librarian, Lorna. Maria has sent in her review and photos of the event all the way from Aberdeen for us to share to those who could not attend. On Tuesday 18th August a group of SLLG members met at the Royal Botanic Garden in Edinburgh. We were taken into a seminar room and given refreshments (including yummy biscuits so that was a good start!). Once we were all together there was a talk about the history of the Botanic Garden and what working in the library and archives covers and involves today. It’s always so interesting to see what other “librarian” roles involve and compare how different they are to our own, such a diversity! Information for those who missed the event, information is available on their website. We were then escorted into the library where a fabulous exhibition of interesting items was laid out and each was shown and described to us in great detail. It was fun to hear the oohs and aahs and see people shuffle closer to the “precious things” as certain items appealed to different people. Not being very green fingered myself I admired the pretty pictures and was quite taken with my first ever viewing of a Hortus Siccus, i.e. bound collection of plant specimens. Amazing to see how well these previously living cuttings had survived pressed into the pages of a book many years ago. Afterwards, we headed to The Cross and Corner for a pleasant dinner and a good chat through our visit, before each heading home. The point where I wished I was staying in Edinburgh for the night instead of driving home to Aberdeen all alone in the dark… Totally worth it though, another insightful evening in a fascinating location – and of course with lovely and super SLLG colleagues. Many thanks to our committee member, Alison, for organising the evening for the SLLG membership. The SLLG committee aim to have a varied schedule of training courses, socials and visits to libraries of interest each year for members. If any member would like to suggest a library the group could visit, please contact a member of the committee.